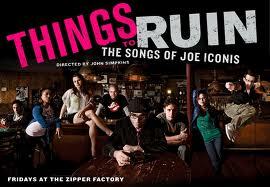 Attention Joe Iconis fans! We’re pleased to announce that “Things to Ruin” will be making a comeback! Join us at Le Poisson Rouge on February 28 at 10pm, March 7 at 7:30pm, March 20 at 10:30pm, and March 28 at 10:30pm. “Like” Things to Ruin on Facebook! Tomorrow is the first night of Knickerbocker Holiday, staring Victor Garber and Broadway superstar/Sh-K-Artist Kelli O’Hara! The two-night-only event will be performed at the Alice Tully Hall at Lincoln Center on January 25th and 26th, and will be recorded live. Check out this link for more info on the performances, and this link for updates about the recording! “Women on the Verge” Play by Play! Hey Sh-K-Fans! We had a great time in the studio yesterday recording the vocal tracks for “Women on the Verge of a Nervous Breakdown”! The album is sounding fantastic! In case you missed it, we had play-by-play updates on our facebook page and twitter. Click those links for a look back at what went on yesterday! Don’t forget to check out the Women on the Verge page for updates! Will Van Dyke Concert TONIGHT! Tonight’s the night for Will Van Dyke’s concert at Le Poisson Rouge! There’s a list of fantastic performers lined up, including Alex Brightman (Wicked), Katie Rose Clarke (Wicked, The Light In The Piazza), Matt Doyle (Bye Bye Birdie, Spring Awakening), Katie Gassert (Seussical), Celisse Henderson (Wicked, In Transit), Jay Armstrong Johnson (Hair), Morgan Karr (Spring Awakening), Carrie Manolakos (Wicked, Mama Mia! ), Lindsay Mendez (Everyday Rapture, Grease), John Eric Parker (Memphis, Rent) and Andrew Rannels (Jersey Boys, Hairspray). Don’t miss a night of great talent and great music! Celebrate the Music of Adam Gwon! Be sure to check out Adam Gwon and Company tonight at (Le) Poisson Rouge (at 10p.m.) as we celebrate the release of the cast recording of Ordinary Days! Adam will be joined by the original cast of Ordinary Days and some special guests. Don’t miss this terrific talent and the release of Ordinary Days! (Le) Poisson Rouge. January 11, 2010. 10 p.m.
Hey Sh-K-Fans! Happy Thursday! Check out these pictures from last night’s Cabaret Cares benefit at the Laurie Beechman Theatre, featuring the In the Heights cast as well as some Heights alumni. Don’t miss your last chance to see In the Heights on Broadway! Lin Manuel Miranda and the rest of the Heights crew will close out the show on this Sunday, 1/9. Kicking off the new year with a cast album! Happy New Year, Sh-K-fans! Great news to start off 2011! It has just been announced that we will record Women on the Verge of a Nervous Breakdown! Keep your eyes out for a spring release. You won’t want to miss this album featuring Sh-K-Artists and Broadway superstars Patti LuPone, David Yazbek, Laura Benanti, Brian Stokes Mitchell and Sherie Rene Scott! Kait Kerrigan and Brian Lowdermilk are two of musical theatre’s brightest, award winning young writers. Together with some of Broadway’s favorite singers, they have created their debut album, Our First Mistake. The album will be released January 18, but is now available for pre-order at Sh-K-Boom! Tony Award winning actress and singer Alice Ripley’s newest work, Daily Practice, will be released February 15! This exciting new album features Alice and her guitar, with her own take on popular songs by famous artists such as Sting and Bruce Springsteen. Check out the album page for pre-sale updates!